So we've gone from the days of Dana to this monstrosity to your left. 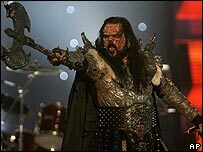 Yes, Finland have prevailed in the Eurovision backslapping song contest with the song Hard Rock Hallelujah by "horror rock" group Lordi. Brian Kennedy's dire song "A cry for love" cried its way to a surprising 10th place finish for Ireland. The UK ended up 19th. I must say I'm getting fed up now with the voting tactics of these European countries. Ever since they changed the voting system from judges to text votes we've seen countries constantly voting for their neighbours! It's ridiculous. Terry Wogan's commentary made things tolerable during the event. I was pleased to see ourselves and the British doing likewise and voting for each other. If you can't beat 'em, join 'em, eh? Alas I fear we will never win this competition again, even with a good song, as the whole event is a shambles. I think it's time ourselves, the British and a few other countries left as we are being discriminated against by the voting system. After all, why remain part of a group of European nations that is more concerned with looking after its own selfish interests?